Everyone loves dinosaurs -- which is why, unusual drought periods notwithstanding (a couple of years ago there were a few months that I couldn't find any dollar dinos), cheap toys of the terrible lizards are readily available in just about any store that sells playthings for the kiddies. Moreover, for cheap toys, these dinosaurs are often quite good: they often have sculpts as detailed as much more expensive figures and relatively complex paint jobs with multiple applications and advanced techniques like washes and drybrushing, and sometimes they even boast sound chips or other play features like glow-in-the-dark or light-up capabilities. Unfortunately, despite the dinosaur love -- and despite the coolness of the dollar dino set -- those beasts of old rarely end up getting merchandise that would appeal to action figure collectors. There are plenty of high-end dinosaur figurines and models for the dinosaur enthusiast, but very few articulated figure lines. 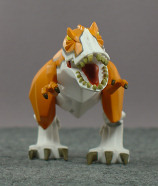 The most prominent one at the moment is the Dino-Riders-esque line from Imaginext, but those dinos (while cool) are hardly superarticulated... and their cutesy appearance makes many of them a whole lot less appealing to yours truly. I mean, seriously -- what good is a raptor without teeth?! 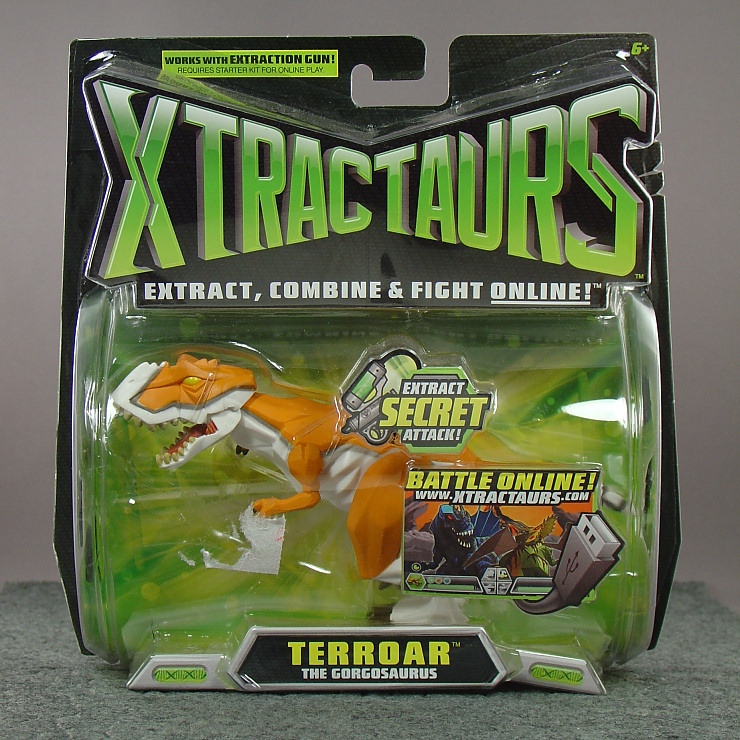 Even Mattel's Xtractaurs line -- which was a lot more visible when it debuted in 2009 but has since gone the way of, well, the dinosaur -- had fairly basic articulation (albeit more than your standard dollar dinos, since they have none at all). It did, however, have a cool stylized look that cast the creatures as things you'd be more likely to run from than hug and pet. It also originally had a prohibitive price tag, since its main gimmick was an online battle component that involved TRS ports and USB guns and whatever programming and hardware was required to run that stuff. I didn't care about that, though. I just thought the toys looked cool -- but nowhere near cool enough to buy at $11 a pop. The reduced price of $2.49 at Ollie's, however (and the fact that the figures nearly sold out in one week), was enough to get me to bite on Terroar the gorgosaurus. Anyway, check out the packaging above. It's pretty attractive, with a style that gives it a futuristic genetics lab accident GONE WRONG kind of vibe, and on the back there's cool artwork and a basic rundown of the online component (which we're not going to discuss). There's also a pretty cool line -- "This Tyrannosaur's name says it all. He can unleash a terrifying roar that makes his opponents freeze in fear!" -- that's probably written a bit above the kiddies for whom this toy was meant. Heck, at first, even I was like, "How the hell does his name say anything like that?" 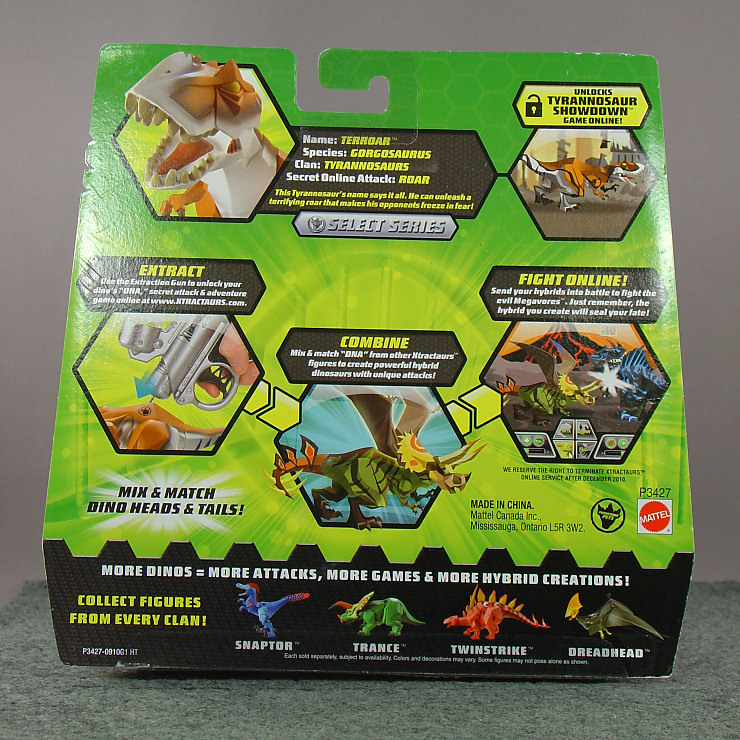 I've since realized that the packaging was talking about his given name, "Terroar" -- which would indeed say it all -- but at first I thought the statement referred to "Gorgosaurus." But that works too if you think about it. See, you can xtract "Gorgon" from "Gorgosaurus"... and the Gorgons were known for freezing their victims in place (by turning them to stone). Sure, they used their piercing eyes and hideous faces rather than throaty bellows, but even so you have to admit that Mattel's writers were working overtime to stuff an ambiguous reference to a lame punny name and/or a clever classical allusion into a two-sentence blurb on the back of a toy meant for kids ages six and up. I totally want that job. Here's Terroar out of the package. He's quite cool for what he is -- a stylized tyrannosaurus gorgosaurus with a fairly subdued color scheme and limited articulation -- but what he is isn't terribly impressive and would be even less so if his main competition weren't cute toys for toddlers and unarticulated hollow dollar store fodder. 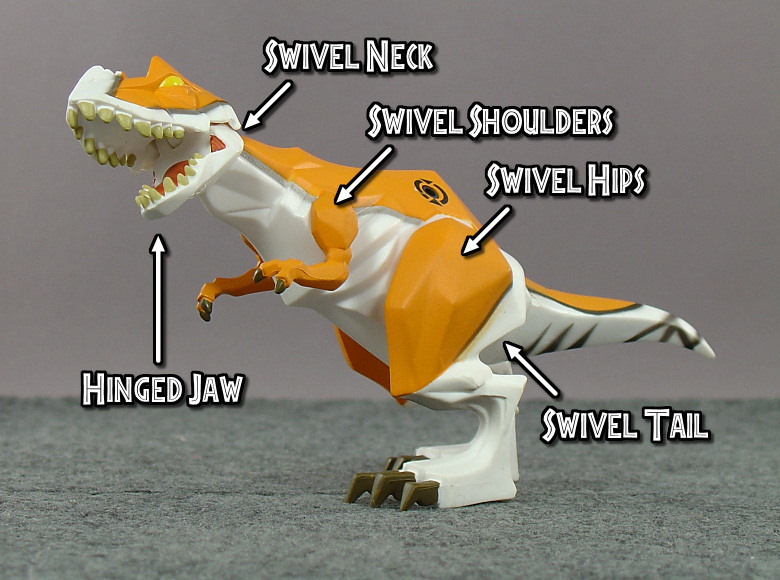 It's a sad commentary on dinosaur toys when seven points of articulation seems like a lot, isn't it? That said, those seven points do afford Terroar some posing variety: while the neck swivel and especially the tail swivel aren't very useful, the figure can lean forward and raise up and "roar" and... not roar, which is, again, more than you'll get from most dinosaur toys. It's also worth noting that -- like the Quikfire figure Nathan Newell reviewed on Dork Dimension ages ago -- Terroar (which appears to share Quikfire's sculpt except for the head) couldn't stand on his own when I first removed him from the package. However, this was because the packaging warped the leg, and the figure stood fine once I realigned it using the hot/cold trick. So yeah, between the posing and the general style of the figure, Terroar looks pretty good -- even though the paint is weak by technical standards, with really fuzzy lines, bleed in some areas, really poor and misaligned coverage on the teeth, and overall a less dramatic color scheme than most of the figures in the Xtractaurs line. It's the kind of thing where I can clearly see the flaws, but they don't really bother me (and I'm the kind of OCD guy who once spent 40 minutes rifling through pegs of Optimus Primes to find the one with the best paint job). Granted, the $2.49 price tag probably has something to do with my willingness to forgive the weak and lacking paint -- at $11 it'd be a whole lot more irritating -- but still. And here's a size comparison shot. Terroar is much smaller than a 6" figure, about the height of a 3.75" figure (shorter in "crouching" poses), and -- judging from this pic -- is actually in realistic scale with 2" figures like the Transformers Human Alliance drivers. 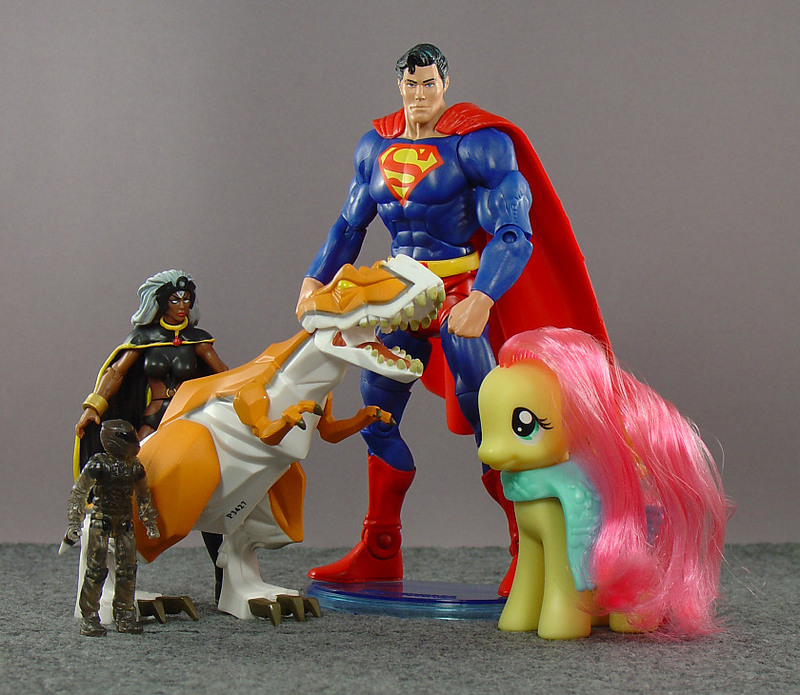 He's also a good size for menacing G4 ponies, if you want a figure to do that! But in general, while one could find various reasons to slot a dinosaur of this size into the Marvel Universe (and while the whack scale of the Transformers lines means Terroar could convincingly stand alongside many of those figures), most adult collectors will find the Xtractaurs dinosaurs to be in a class of their own in terms of scale and style. Kids and less rigid collectors, however, will have no problem crossing Terroar and company over into all manner of toy universes. So Terroar isn't really an impressive figure. 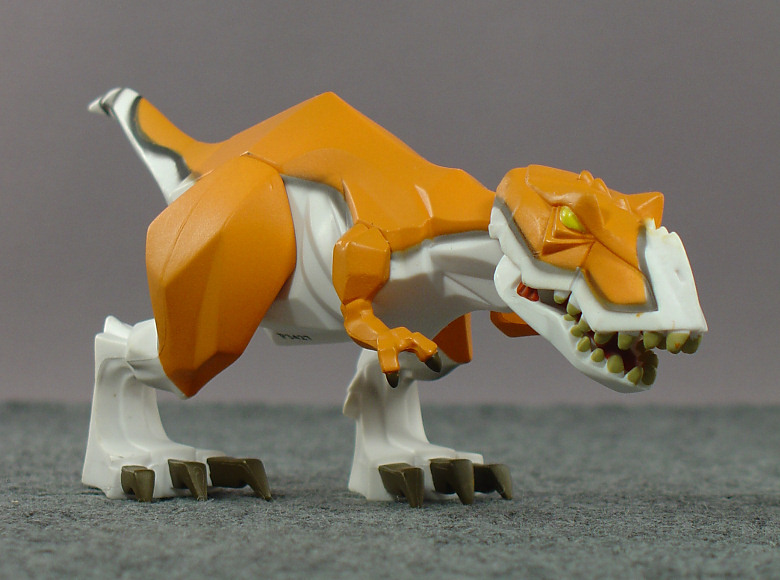 In fact, articulation notwithstanding, the figure is arguably inferior to those plentiful dollar store dinosaurs -- most folks would probably prefer a realistic sculpt to the simplified, stylized look here, and the paint definitely leaves something to be desired (though dollar dino paint can be pretty inconsistent). 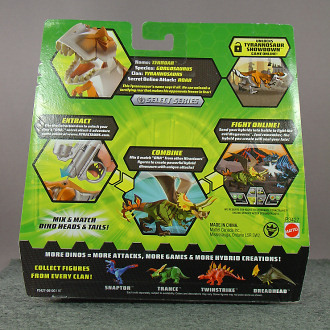 That said, Terroar does look kinda cool and is fun to pose in his limited capacity, and in any case $2.49 for a fun dinosaur-themed collectible doesn't feel like a total ripoff. (I imagine the figure will be even more appealing if you dig the online component, assuming Mattel still supports that feature of the line.) I ultimately like Terroar a lot more than his strengths merit -- and despite the figure's flaws and limitations, I do think it's a good toy. If I ever run into more Xtractaurs figures at this price, I won't hesitate to bite again.